It’s fairly common to see tanks used in various industries that have load cells or weigh bars underneath, connected to a digital weight indicator. This is a great way to keep track of how much product is inside the tank. These systems generally work very well but every now and then you will find a system that has some errors. Below is a list of problem areas to consider when it comes to tanks and hoppers that have load cells. The information applies to tanks and hoppers currently in operation and also if you’re thinking of putting load cells under one of your existing tanks the information below could help you make a better decision as well. Probably the number one issue we see is binding. It could be due to something like rigid piping or some kind of attachment that has been added or modified since the scale was put into service. Whatever the case may be, the tank needs to be free and able to get an accurate and consistent weight. We typically see either three or four module systems and that is usually what we recommend. What type of load cell should you choose? Talk with your scale company to determine what load cell will work the best. The single-ended shear beam cell is designed for low-profile scale and process applications. The shear-beam cell strain gauge cavity contains a thin metal diaphragm onto which the strain gauges are mounted. Typical shear beam capacities range from 1,000 lbs through 20,000 lbs, although some manufacturers offer shear beams up to 40,000 lbs. One end of the shear-beam contains the mounting holes while the opposite end is where the cell is loaded. The cell should be mounted on a flat, smooth surface with high strength hardened bolts. The larger shear beam cells have more than two mounting holes to accommodate extra bolts and keep the hardware from stretching under stress load. The double ended shear beam characteristics are similar to those of the single-ended shear beam. The most common bridge resistance for this load cell is 700 ohm. It is most commonly used in truck scales and tank and hopper applications. Instead of being secured at one end with the load applied to the other end as in the single-ended shear beam, the double-ended shear beam is secured at both ends with the load applied to the center of the load cell. As in all shear beam designs the strain gauges are mounted on a thin web in the center of the cell’s machined cavity. S-Beam load cells derive their name from their shape which is the shape of the letter S. The S-beam is normally used in tension applications. However, there are S-beams available which are bidirectional. They are primarily used for mechanical-to-electronic scale conversions, platform scale and general purpose weighing applications. They vary in size from as low as 25 lbs to as high as 20,000 lbs. When mounting an S-beam, remember to include the side from which the cable extends is the dead portion of the system. Movement of the cable in the live part of the system can be a source of weighing errors. Aluminum load cell elements are used primarily in single point, low capacity applications. The alloy of choice is 2023 because of its low creep and hysteresis characteristics. Aluminum load cells have relatively thick web sections compared to tool steel cells of comparable capacities. This is necessary to provide the proper amount of deflection in the element at capacity. Machining costs are usually lower on aluminum elements due to the softness of the material. Single point designs can be gauged for costs similar to those of bending beams. Load cells manufactured from tool steel elements are by far the most popular cells in use today. The cost to performance ratio is better for tool steel elements compared to either aluminum or stainless steel designs. Stainless steel load cells are made from 17-4ph, which is the alloy having the best overall performance qualities of any of the stainless derivatives. Stainless steel cells are more expensive than tool steel load cells. They are sometimes fitted with hermetically sealed web cavities which makes them an ideal choice for corrosive, high moisture applications. Stainless steel load cells that are not hermetically sealed have little advantage over comparable cells constructed of tool steel, other than a higher resistance to corrosion. Environmentally protected load cells are designed for “normal” environmental factors encountered in indoor or protected outdoor weighing applications. By far the most popular type, these load cells may employ strategies like potting, rubber booting, or redundant sealing to afford some protection from moisture infiltration. Potted load cells utilize one of several types of industrial potting materials. The liquid potting material fills the strain gauge cavity then gels, completely covering the strain gauge and wiring surfaces. While this may significantly diminish the chance of moisture contamination, it does not guarantee extended waterproof performance, nor does it withstand corrosive attack. A second method of protection uses an adhesive foam-backed plate. This protection affords some moisture and foreign object protection. In many cases, manufacturers will use a caulking material to seal the plate to decrease the potential for cavity contamination. A common approach among manufacturers to further decrease the entry of moisture to the strain gauge combines both a potted cavity and a foam-backed plate, in a process called redundant sealing. Yet another strain gauge cavity protection strategy is the rubber boot. Commonly employed with cantilever and bending beam models, the boot covers the cavity and is secured by clamps. While this provides easy access for repairs, the boot may crack if not lubricated regularly, allowing contaminants into the load cell cavity. Lubricating the rubber boot during routine inspections will contribute to the long-term durability of the load cell. Protecting the strain gauge cavity is just one consideration in protecting a load cell from contamination. Another susceptible area is the cable entry into the body of the load cell. Most environmentally protected load cells incorporate an “O” ring and cable compression fitting to seal the entry area. This design provides protection only in applications with minimal moisture. In high-moisture areas, it is safest to install all cabling in conduit, providing both a moisture barrier and mechanical protection. Although environmentally protected load cells keep out unwanted contaminants, they are not suited for high moisture, steam, or direct wash down applications. The only long-term strategy for these applications is to use true hermetically sealed load cells. Hermetically sealed load cells offer the best protection available for the weighing market. Using advanced welding techniques and ultra-thin metal seals, these load cells handle the extremes of harsh chemical and washdown applications. What makes the seal unique is the process of laser-welding metal covers to protect the strain gauge and compensation chambers. The cavities are then injected with potting or, in the case of glass-to-metal seals, filled with a pressurized inert gas, providing a redundant seal. As a final assurance of the integrity of the seal, a leak test is conducted to reveal any microscopic flaws in the sealing weld. True hermetic protection addresses both the strain gauge cavity and cable entry area. The most advanced cable entry design employs a unique glass-to-metal bonding seal which makes the cable termination area impervious to moisture. Cable wires terminate at the point of connection to the load cell, where they are soldered to hermetically sealed pins that carry signals to the sealed strain gauge area through a glass-to-metal seal. Water or other contaminants cannot “wick up” into the load cell, since the cable ends at the entry point. This design allows for field-replaceable cable, since the connection is outside the load cell. Note, stainless steel load cells are not synonymous with hermetically sealed load cells. 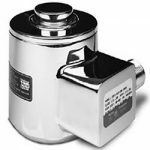 While environmentally-protected stainless steel load cells may be suitable for dry chemical corrosive environments, hermetically sealed stainless steel models are the appropriate choice for high-moisture or washdown applications. It is vital to the performance of a weighing system to select load cells of the correct capacity. Here are some guidelines, all load cells selected must be of the same capacity. Estimate the vessel dead weight, including all piping, pumps, agitators, insulation and vessel heating fluids. Add the maximum live weight of product to be weighed to the dead weight. This is the gross weight of the vessel and contents. Divide the gross weight by the number of legs or support points. This is the nominal weight which will be carried by each load cell. Select a load cell with a capacity somewhat greater than the nominal weight. The following should be considered when determining how much greater the load cell capacity should be; is your dead weight accurate? Will the load be evenly distributed on all cells? Is the vessel fitted with an agitator or subjected to shock loading? Is it possible the vessel will be overfilled, exceeding your live weight value? Will the vessel be subjected to wind or seismic loading? A good rule of thumb is to select a load cell with a capacity 25-50% in excess of the calculated nominal load per cell. Once the load cell capacity has been determined, check that the live weight signal is adequate for the instrumentation selected. If you’re designing your tank you will want to make sure that you provide an easy way for scale companies to hang test weights evenly all around the tank for testing and calibrating your system. Also, don’t forget to take safety into consideration. Our scale technicians are fairly agile but a little planning up front can make the tanks much easier to test and work on. If you’re in the planning stage, make sure you work with a scale company to ensure that you spec the right parts for your application. For example, we look at several factors such as the weight of the tank, number of legs, and the expected amount of product the tank will hold to determine what capacity of load cell or weigh bar to place underneath. Finally, you need to think about the environmental conditions such as extreme temperatures, moisture, vibration, and corrosive substances. If any of these elements take place, adjustments such as digital filtering or different products such as hermetically sealed load cells may be recommended. If you’re looking to place load cells under your tank or add load cells to your hopper, contact us at (919) 776-7737 and we can discuss the options that are available. Every now and then we are asked if there are any Made in the USA strain gauge load cells available and the answer is yes, in fact we wrote about that not too long ago, you can click here to see that article. 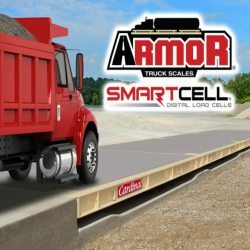 Today I wanted to look at several of the load cell designs that are available from Cardinal that distributors like Central Carolina Scale sell everyday. Of course, load cells convert force into an electrical signal and are a very important part of things like hanging scales, truck scales, floor scales, and many other medical or industrial weighing systems. The load cell sensor detects force and moves the strain gauge, which then measures the movement as an electrical signal that can be used to give power to the scale. 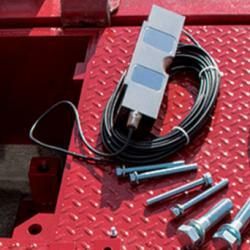 At Central Carolina Scale, we have a wide range of standard load cells in stock. If you’re looking for custom load cells, we can get quotes on those, usually within one business day. We also provide weighing assemblies used in tank weighing and batching systems and bulk weighing applications. With over 30,000 quality items available in stock, nobody offers faster, more reliable load cells for your applications. From small tension sensors to 1,000,000 lb capacity truck scale and tank weighing assemblies, we have solutions to fit any need. Our extensive inventory of equipment and accessories means you can get your replacement or new load cell quickly. Is It Alright To Cut Load Cell Cable? We recently were asked about cutting load cell cable since the cable on the customer’s load cell was too long for his particular application. The standard line of thinking is that I should not cut load cell cable because it may void the manufacturer’s warranty. Are there any recommendations for altering load cell cable that might be different than cutting? Actually there are several things you can do. Many load cell manufacturers recommend NOT altering (shortening) the load cell cable length, and most manufacturers will not honor the warranty on altered products. 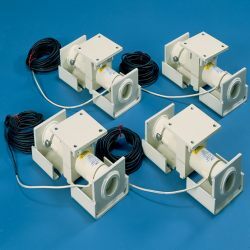 However, for the majority of load cell installations, any output change resulting from cable length alteration is easily compensated for with a junction box with trimming capability. Excess cable should be coiled and secured within the junction box (if it will fit). If the excess cable will not fit inside the junction box, it will need to be coiled, and secured externally to the junction box with wire ties, or other suitable means. If the cables are routed in conduit, and excess cable will not fit within the junction box, then the only option may be to cut the cable(s) to length. What about if the load cell cable is too short? Well, we recommend avoiding splicing when possible; however, if you need to gain cable length, it is very important to use the correct splicing technique. Ensure the integrity of the cable is maintained, including voltage, current (signal) ratings, shielding, moisture resistance, and tensile strength. Our recommendation is to use a potted cable splicing kit when possible. If you need a reusable splice point, a sealed junction box may be used. Hope this helps you understand shortening and lengthening load cell cable for specific applications. We just recently received this update below from Pennsylvania Scale. So we figured that we’d share the update in a simple top 10 list kind of like you might see on late night tv. Number ten is LOAD CELLS. We sell a lot of load cells. Due to that volume, we can offer attractive pricing for cells such as TANK MOUNTS, S-TYPES, ALTERNATIVE CAPACITIES, TENSION MOUNT KITS, etc. If you are shopping for load cells for your customers, service facilities, or special projects, please contact us a quotation! Number nine is SHIPMENTS. The factory just upgraded and added UPS new service for larger-than-parcel but smaller-than-LTL freight packages. This service is ideal for 6400’s and M64’s which are pushing 100 lbs. So if you order a Pennsylvania Scale item, please mention “the new BEST WAY shipping”, and we will automatically upgrade the shipment to the most efficient cost-effective way, including UPS HUNDREDWEIGHT or the new service. Number eight is FREIGHT DISCOUNTS. The factory in Lancaster PA has some amazing outbound freight rates from popular carriers. Unlike some of the competition Pennsylvania does pass along the outbound volume discount for PREPAY & ADD shipments. You may be very surprised! Number seven is BAGGAGE SCALE ELECTRONIC KITS are once again hot items as government and aviation spending is finally coming back. 1-4 displays. Keep the existing platform and do both your customers and yourself a huge favor and upgrade to more reliable and serviceable M64 electronics. Number six is PANEL MOUNT OPTIONS for scale indicators. We have a new design that allows retrofitting of panel-mounted indicators fitting the cut-outs for both the former UMC-600 and UMC700 models as well as the smaller openings for the original UMC-555 models, making exact field replacement easy and efficient. Contact factory for details. Alright we’re half way home. Number five is HIGH RESOLUTION WEIGHING, many distributors are replacing overcomplicated and hard-to-use “foreign” indicators with Pennsylvania 7600 series indicators in high resolution applications. You can easily ‘push’ resolution on Pennsylvania scales and meters due, in a large part, to the premium A-D converter they use… If you need to add utility and simplify life for your maintenance technicians as well as your employees, try using 7600+ or 7600E units. Number four is non-standard resolutions and weight units can be easily handled at the factory—including ‘pushed’ resolution (non-NTEP), double/triple ranging, special units of measure (PRIMARY/SECONDARY units—specify with order, n/c). Like a certain fast food burger chain likes to say, special orders don’t upset us – all we ask is that you let us build it your way!